It’s been two years since we’ve updated the skewer review, so it’s a good time to re-visit it and see what’s changed. We’ve dropped a couple out-of-production skewers and added a few more, plus updating existing ones to stay current. Skewers are an often overlooked component on the bike, even though they can be a great way to reduce significant weight for a small price. Of course getting a skewer that doesn’t work for you may make any weight savings not worth it — it doesn’t matter how light a skewer is if it just lets the rear wheel slip under load. We’ve opted to review only skewers we know and trust. 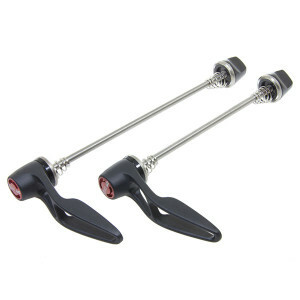 There is nothing in this review that we don’t consider a good skewer and most of these will work for just about any rider, but maybe not in all circumstances. Hopefully the following will help you find that one that meets your needs the best. 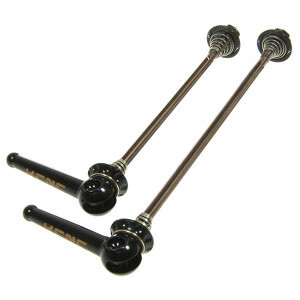 Rod Length: 160mm rear, 126mm front. Carbon ti is very nicely finished with a svelte titanium handle that not only looks good but feels solid in hand, especially given the weight. It’s the 5th lightest out of 17 and 10th in terms of price. The nut is very small but knurled enough so that there is plenty of grip yet not harsh on the fingers. The cup on the cam is a 360 degree so it does not require manual alignment. This is also one of only 2 skewers in the review that comes in white. Certainly one of our favorite of superlight skewers. 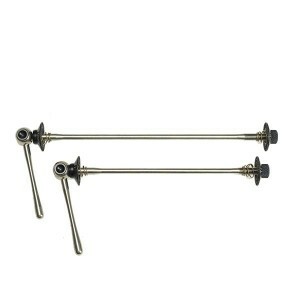 Rod Length: 160mm rear, 129mm front. The Control Tech Race is a skewer but isn’t a quick release. Not having a quick release handle gives it a good advantage in terms of weight, it’s the 2nd lightest of all skewers we tested. 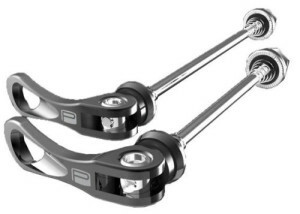 It also has an advantage in price being the 4th least expensive (2nd least expensive with ti axle). Being a bolt on skewer gives it plenty of tightening power, ideal for those that need something light with lots of clamping power. The drawback is that you do have to carry and use a tool for wheel removal. 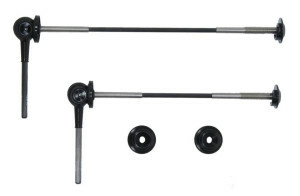 Rod Length: 160mm rear, 131mm front. The DT RWS is a truly unique skewer in the review. 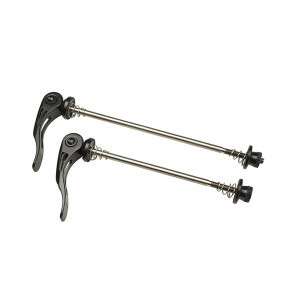 It behaves more like a wingnut with a free adjustment to allow the handle to be placed exactly where you need it. 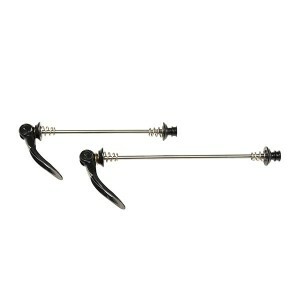 It combines the large clamping force of the Control Tech with the ease of the quick release skewers since there is no tool needed. 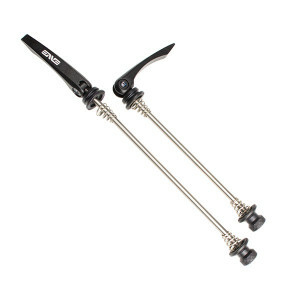 The RWS however is one of the heaviest skewers in the review being lighter than only the Dura Ace 9000. Also the handle is a bit large which is great for tightening but not so for aesthetics. Enve has recently changed their skewer design. The ti lands 12th out of 17 in terms of weight. It has an average size handle and a fairly large nut which makes use a snap. It’s available in both steel and ti but with the small price difference the ti is definitely the more appealing of the two versions. The cam action can be a little sticky during operation. 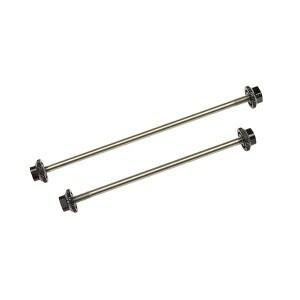 Enve, as mentioned, makes this skewer in a titanium and steel axle version. 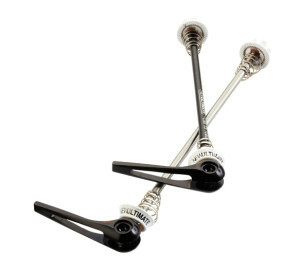 Given that it’s only a $13 upgrade to save 18g when comparing the ti and steel version we believe it’s worth looking past this skewer and just going with the Ti. 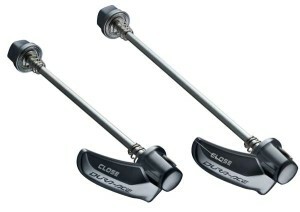 Rod Length: 165mm rear, 128mm front. The Aliens3 has been around and basically unchanged for many years, and with good reason. This is still one of our favorite all time skewers. The cam would require manual placement because it’s not a cup design, however the concave end is held in place by an internal circlip which means it never comes out of alignment. Springs are pressed into both the cam and nut so they don’t move on the axle which speeds wheel changes. 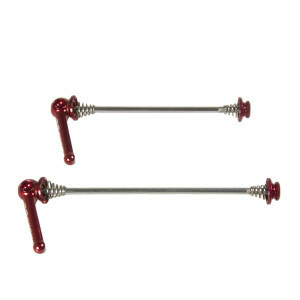 The newest version of the skewer also has a two piece nut so the plate can stay stationary while the nut is tightened. The amount of thought and engineering they put into the design over the years is truly amazing and it shows in the function. In terms of weight it hits better than mid field at 6th out of 17. The Aliens4 is basically a stripped down and lighter version of the Aliens3. It has a lot of the same engineering as the Aliens3 but done in a way to reduce weight. The handle is still large and nicely shaped, though slightly smaller. The nut is smaller but retains the two piece rotating design. 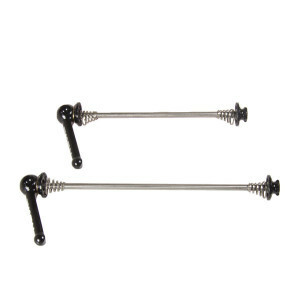 The skewer also uses the press fit springs that don’t move on the axle. The cam is a cup design that does not require manual alignment and the butting on the axle is more aggressive. All this results in a skewer which works almost like the Aliens3 but at about 30% less weight. 6th out of 17 in overall weight. travel however is increased. Overall this is a really nice lightweight skewer with good function. 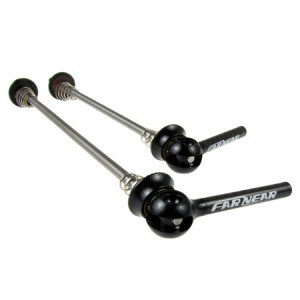 Rod Length: 157 Rear, 125 front. Very similar in design to the original Kcnc. It has a long handle and good retention. appeal to everyone. But functionally there is nothing to fault here. the brass cam to reduce noise and make operation smoother. two changes. The main change is that the titanium shaft is machined out on 4 sides which shaves 5 grams of weight. less weight and an increase in price. the handle, but at the same time one of the least friendly on hand. It’s especially nice that it is available in white which is something hard to find in skewers. At 99 grams the Promax QR-2 is one of the heavier skewers in the review, but is one of the least expensive. It has also got the most cam travel of any skewer in the review which helps to get over lawyer tabs quicker. Combine the large cam travel with the stout steel axle and this skewer has a lot of clamping force, nearly rivaling the Dura Ace 9000. A large handle which is friendly on the hand also makes applying that force very easy. 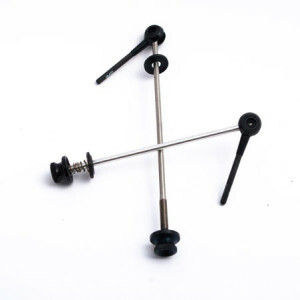 An ideal skewer for someone with an eye on secure clamping and price. concern and the only thing that matters is performance this is a good choice. that grips well and clamps securely. It uses a butted titanium rear and a butted aluminum front shaft. 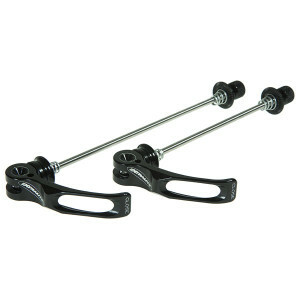 It’s also the 3rd lightest quick release tested. A true functional weight weenie product. outside of a hub where they can be appreciated, but that also comes at a hefty price. Woodman designed this skewer with an eye on balance. Not heavy, but not light. Not terribly expensive, but still using titanium for the shaft. They handle is large and easy to use. The nut is small to help keep the weight down but not too small. They also opted to not use the delrin bushing in the cam, which results in a little more friction but gives the skewer much better grip and longevity since there is no delrin to compress.